In order to put an entire marketing campaign together it first takes vision. 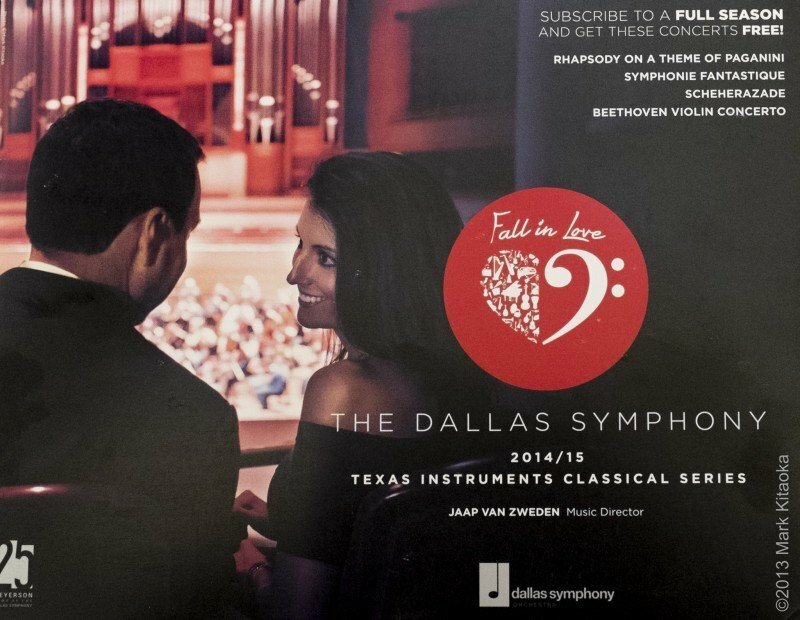 The Marketing VP at Dallas Symphony Orchestra had a very specific vision for his 2014-15 Season Brochure. 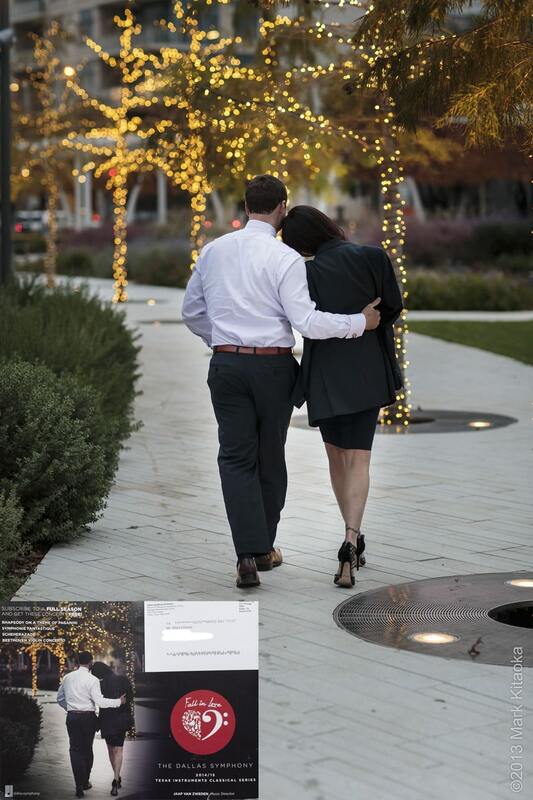 His concept was to carry a “Date Night” theme throughout his brochure, creating an experience which would attract new as well as existing patrons. 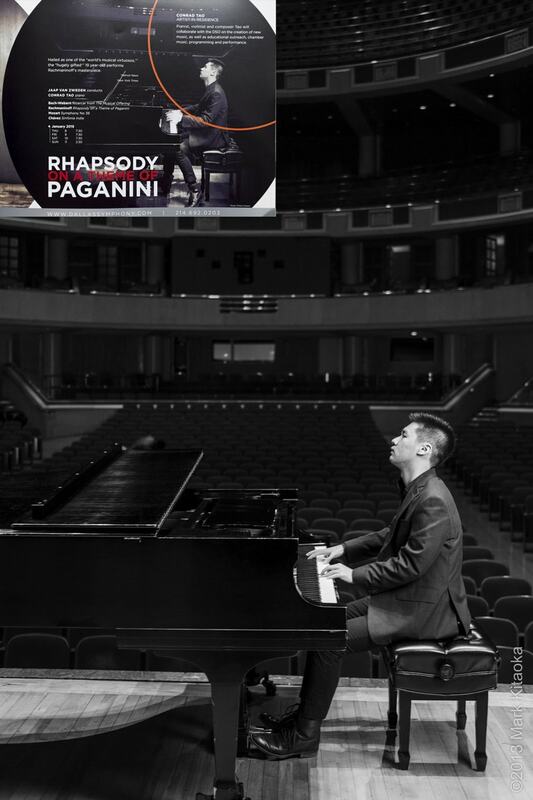 He also wanted a theatrical and dream like quality to the individual performances, one that matched each symphonic piece. Keep in mind that whenever you’re hired to create commercial imagery there is quite a bit at stake. Beyond your own reputation, there’s the talent, scheduling, venue logistics, graphics gurus, administrative help, travel, blah, blah blah. And although an Art Director may have a specific shot they have in their own minds, it’s up to the photographer to execute that vision, one that often only exists in the AD’s mind. I often chuckle when people assume that commercial shooters have tons of time, space and perfect shooting conditions in which to work. Nothing could be further from the reality of what we are so often presented with in our sessions. For this campaign, which was shot over two months in 2013, some were shot in studio in front of seamless and other portions were shot in and around the symphony venue, partner business or buildings. In the months before we began shooting, several conference calls were held to discuss the mood and energy of each individual shoot. 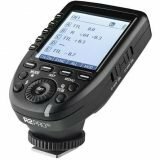 From those conversations and my own familiarity of each location, I had to determine what gear to bring which includes lighting equipment and camera/lens choices. 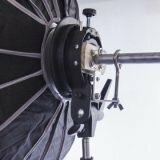 I only rent grip equipment at each client’s venue since my partner and I prefer to bring our own lighting, triggers and modifiers with us to any on location session. Of course no one can anticipate every situation and in those cases one has to improvise and make due with what you have on hand or can fabricate immediately. Before this assignment I had just begun working seriously with continuous light since the vast majority of my work is done with studio strobes. 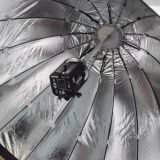 I always experiment with new or different equipment in my personal work so that I become familiar with lighting or camera properties before embarking on any commercial work. (My partner says it’s just because I get bored so easily!) Quite a bit of what was shot for this campaign while on location was lit with continuous lighting. So as I tell all aspiring ‘pros’ personal work is some of the most important work you’ll ever do….for a wide range of reasons. But that thought is for an upcoming post. Collaboration was critical throughout the entire process, but the sessions that involved the lovely couple really illustrated the power of collaboration. 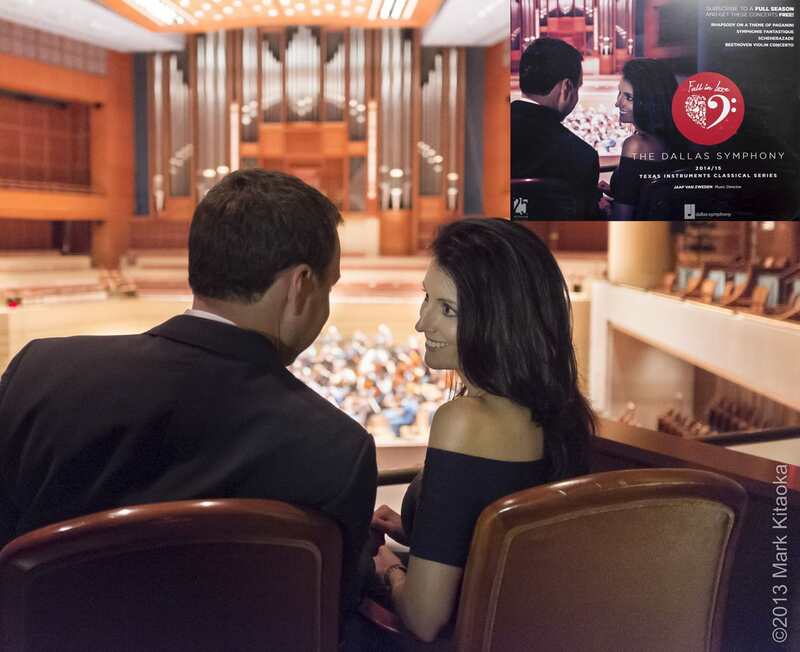 They are not actors or models, but an actual married couple who are subscribers and donors to the DSO. 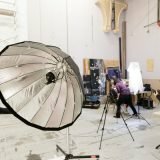 All of their images were shot in one full day. As we moved from venue to venue and shared breaks and meals we had the chance to talk and collaborate on each shot with the Marketing VP, the couple and his staff. At the end of the day they invited us to share dinner, but we were so bushed we asked for a rain check and we’ll be seeing them in a couple of months. Collaborating with all the people involved in any session is the ONLY way to achieve and create imagery that is both compelling and authentic. In my world it’s not only the right way to operate, it’s also very fun. I often think that I just create photographs as a secondary way to get to know people. I’m really blessed to call what were formerly only ‘clients’ – friends. 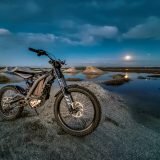 Clicking on each image explains a bit about the situation, setup and gear used. The DSO's Marketing VP had a brilliant concept to illustrate a 'date night' at the DSO, so we took a couple from entry to exit in an attempt to show the experience of an entire evening at the symphony. 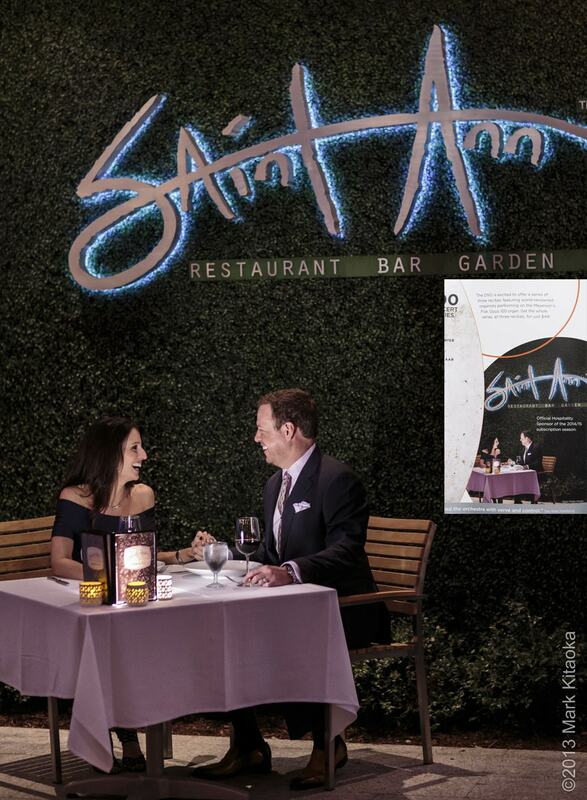 One of the DSO's partner restaurant's Saint Ann in Dallas was the setting for this environmental portrait of the couple enjoying a meal after their evening at the DSO. A very small LED panel was placed behind the wine menu to illuminate their faces. The color temperature of the panel was set to match the candlelight on the table. The rest of the light was natural evening ambient shot at f2.0 with an 85mm f1.2 lens, ISO 6400 attached to a 1DX. This image was made as a composite. Haley, the French horn player was shot separately from the staircase. In order to make her appear as if she was flying, I had her jump in place while I shot her from an elevated position and then rotated the shot to horizontal. 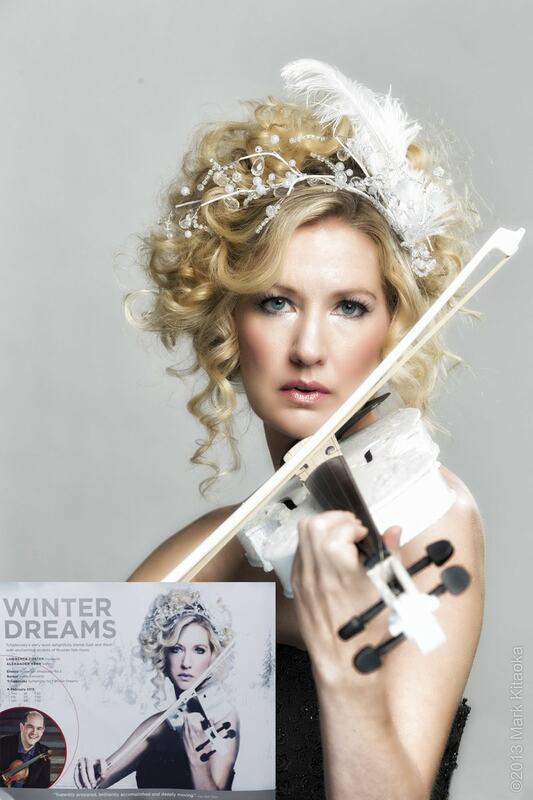 The graphics gurus at the DSO tweaked her hair and dress to make it more dramatic. 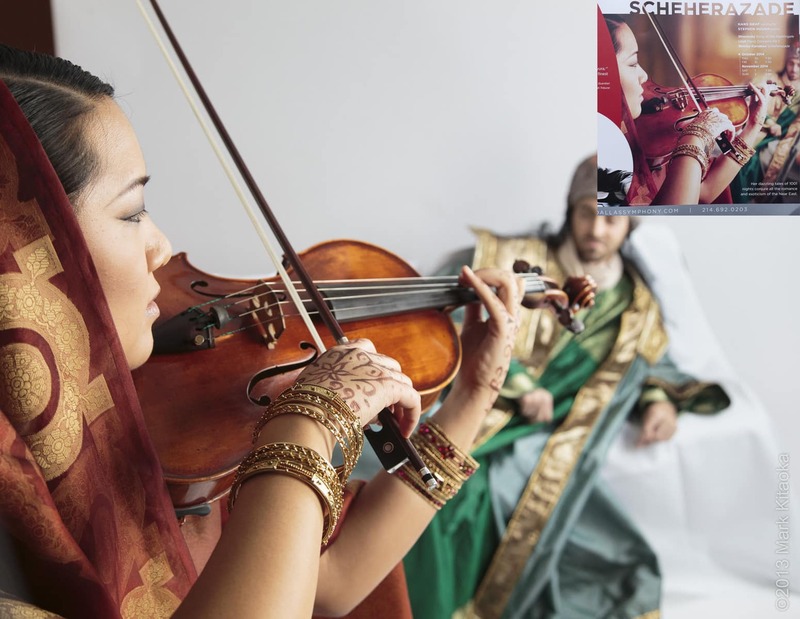 For Scheherazade, a very shallow depth of field was necessary to achieve the look and feel. 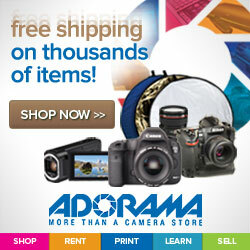 An 85mm f1.2 lens was used to achieve this look.